How about getting a smooth shave on the go, anytime that you want? How incredible would it be if you get this opportunity from a shaver manufactured by one of the world’s leading names, Braun? The Braun MobileShave M-90 Men’s Portable Electric Foil Shaver Travel Battery Razor is the model that we are talking about. It is designed exclusively for men who wants to sport a well-groomed look whenever and wherever he wants, without any hassles. This is one of the most compact shavers available in the market today, and you can easily carry it along with your wherever you go, to get your desired look and style. Let us go through our electric shaver review of the features, pros and cons of this mobile shaver so that you understand more about the same. Offers Smart Foil technology which captures all uneven hairs for a clean shave of your face. Even if your hairs lay in different directions it will get them shaved correctly. 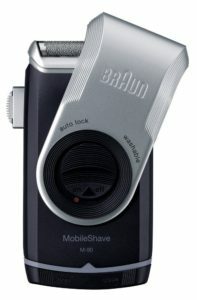 The Braun Mobile Shave M-90 Men’s Portable Electric Foil Shaver is probably the best model that you can find in the price range of less than £20. It is very easy to use, offers more than the decent quality of shave and can be used on the go. These factors should be compelling enough for you to invest in this and try the benefits. It currently has 4.2 out of 5 stars with over 80% with four stars or more, and around 8% with 1 star.